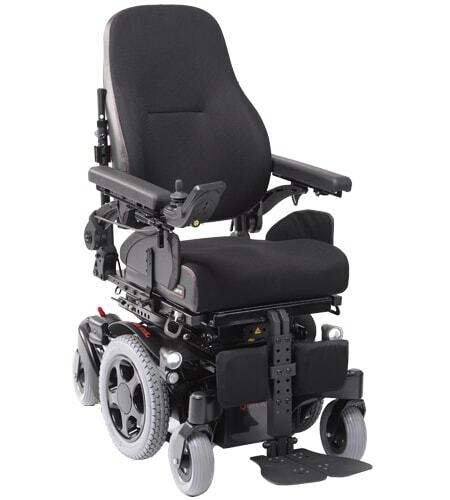 With its slim base of just 52cm, the Salsa M2 Mini Redline is the narrowest high-performance mid-wheel-drive powered wheelchair in the world, providing you with unparalleled indoor agility. Adorned with a sleek matt black chassis and stylishly complimented with red stitching, springs and decals. With an ultra-tight turning circle of 700mm, the Redline provides easy access to narrow indoor spaces, including home lifts and Wheelchair Adapted Vehicles. If you’re interested in the Quickie Salsa M2 Mini Redline then please fill out this form and a local specialist with get in contact with you shortly.